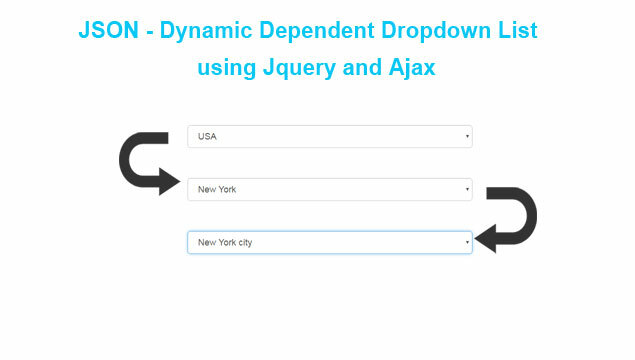 How to make dynamic dependent dropdown list by using Jquery Ajax and JSON. Using of dependent select box will be a require functionality if there is a dependency between options of the select box fields. Dependent dropdown list box when we have select in parent select box then it will allowed to refresh child select box data without refresh of web page. In this post we have JSON file to store data for fill parent and child select box and in that file we have give relationship between Parent data with Child. We will use Ajax Jquery for fetch data from JSON file and filled parent select box. This is a very simple Ajax JQuery code hope you like this. The dynamic dependent dropdown list box is most required for Country State and City select box. So in this post we have made relational select box of Country State City by using JQuery Ajax with JSON array data file. Here first we will filled Parent select box of with Country list fetch from JSON file by using Ajax with JQuery. And here State dependent dynamic select box data has been filled based on selection of parent Country select box. And Same way City dynamic dependent select box data has been filled based on selection of it's parent State drop down list box. That means State data has been related with selection of Country and list of City data has been related with selection of state. So here when we have select any country from select box then here it will fetch state data which are related with particular country and same way when we have select any state from select box then it will fetch city data which are related with particular state by using Ajax JQuery without refresh of web page. In one of our previous web tutorial we have already made dynamic dependent select box by using JQuery Ajax with PHP and Mysql. But here we have do something different here we have fetch data from JSON file by JQuery Ajax and here we have not make any PHP sever side script for fetch data from Mysql database but we have use JSON File and in that we have store country state city data with state data related with country and city data has been related with state. So here we have make simple light weight dynamic dependent dropdown list box because here we have perform all operation at client side not perform any server script for fetch data from Database. So if you have developed any website and in that you have to require any dynamic dependent select box then you can choose this type JSON with Ajax JQuery instead of using PHP Mysql with Aajx JQuery. So lastly this is our simple web tutorial on How to make dynamic dependent select by using JSON with Ajax Jquery. I hope you have enjoy this post. Please keep visit out website for Accessing Web tutorial with Source Code and online demo. It works almost for me, i wanne post (email) the choses, but wen i e-mail them it gives the id an not the name of the chosen city. not working on mine. what did you do? If we put the script part in the first page inside the head tag the program actually works.